John Busby needs no introduction. His fresh, vibrant artwork inspired a whole generation of artists to emulate his discipline of close observation and drawing from life. This latest book (the 36th) from the Langford Press Wildlife Art Series showcases a wide variety of Busby’s work. The range of subjects is wide, including habitats (sea cliffs, shorelines and rock pools), places (India, Kimberley and the Alps) and species (raptors, mammals, grebes and cranes). All are captured swiftly and confidently with bold lines and marks, the result deceptively simple but revealing a well-practised harmony between eye, brain and hand. They are drawn ‘as seen’ with no intrusion of prior knowledge and possess as a result a characteristic immediacy, defining not just a species or a place but a moment. This is drawing as a means of seeing. Some paintings comprise just a few marks but capture nonetheless the fleeting moment of tension or movement. Two, both entitled ‘Estuary scene, Aberlady’, are representative. The muted hues are typical and they contain a minimum of line overlain with a rapid wash. Despite such beguiling simplicity, however, they convey at once the interplay of bird and habitat, the way in which his subjects adopt the colours of their surroundings and how shadows and reflections anchor them in place. Patterns and colour relationships are what is important here, not plumage detail. 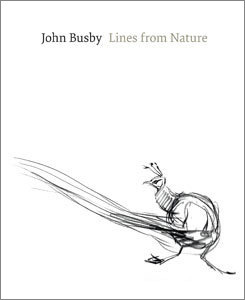 Busby’s prospectus was set out most clearly in his inspirational 1986 book ‘Drawing Birds’. I remember buying a copy as soon as it appeared and being entranced by the energy and life which flowed from its pages. To someone brought up on field guide images, this new permission to see with a fresh, unprejudiced eye was a revelation. 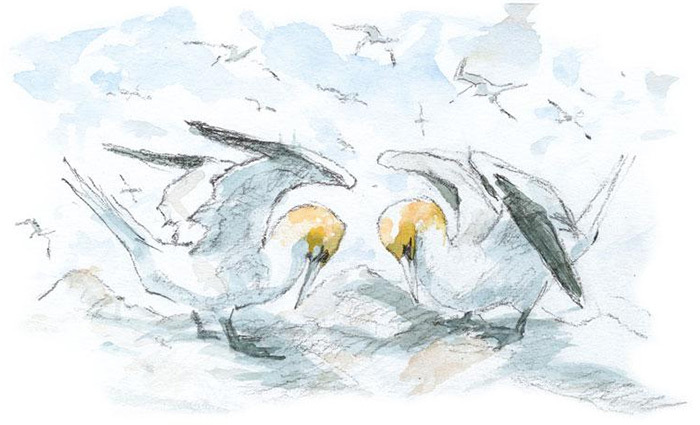 ‘Drawing Birds’ contained an outstanding and inspirational text as well as astonishing artwork. By contrast, the text of this book focuses less on Busby’s artistic philosophy and simply provides a brief accompanying narrative to the pictures. Nevertheless there are some revealing insights in the author’s Introduction where he reflects that “The sheet of paper becomes the air the creature breathes and into which it moves, as well as the place where my thoughts can grow”. I was struck throughout by the similarity between the acts of painting and writing, between the immediacy of an Ennion or Busby painting and the spare, lean prose of Baker or Matthiessen. Both disciplines require a particular intensity of looking, an ability to see truthfully, to register contexts as well as details, and the skill to express it with economy. I was pleased to see this relationship recognised in the text: “Just as when finding the right word to convey a clearer meaning when writing, finding the right line can express so much”. Before ordering: When ordering via WildSounds, the value of the voucher will be deducted from your order when the order is processed. The total displayed on your shopping basket excludes the value of the promo but this will be applied before final payment is taken. The focus here, however, should be on the pictures, and everyone will have their favourites. Mine include the Gannets and Kittiwakes riding the wind, strongly sculptured yet light as air, the simply drawn yet convincingly solid fox cubs, the Lammergeyers which almost fly off the page and, perhaps best of all, the consummate ‘Woodland scene with blackbirds’, a triumph of colour harmony, depth and texture, with Blackbirds just as we see them. The book is a traditional large format art book and the layout is generous and uncluttered, giving lots of ‘breathing space’ to the artwork. The cover is splendidly monochrome and understated, a perfect accompaniment to the book’s title. Busby passed away in June 2015, shortly after completing the work for this book. It therefore acts as a final tribute to his talent. His influence will live on, however, in today’s younger generation of field artists. They, and many others, will surely find a resonance in Busby’s quote from Ruskin: “To see clearly is poetry, philosophy and religion – all in one”.